This figure fist appeared as ?Leia (Hoth Outfit)? on The Empire Strikes Back 41 back card. Its name was changed to ?Leia Organa (Hoth Outfit)? on the The Empire Strikes Back 47 back card, and once again it was change, this time to ?Princess Leia Organa (Hoth Outfit)? on the Return Of The Jedi 65 back card. The last name change was kept on all cards to follow. 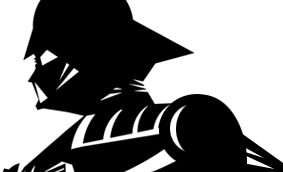 The image was changed when the figure was released on the Tri-Logo card back. 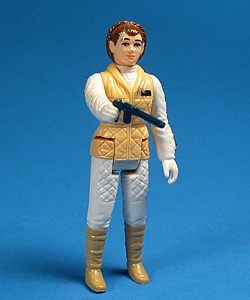 Comments: The vintage Leia (Hoth Outfit) action figure was the second lead character Kenner produced in their successful Hoth collection. Though not as well sculpted as the other Leia in The Empire Strikes Back line, this is the figure that best represents the character, since she wore this outfit for most of the film. Major Variations: Though all vintage figures have minor variations, The Leia (Hoth Outfit) figure has more than its fair share of noticeable variations. The figure not only featured many different coloured spray ops, ranging from light reddish-brown to dark chocolate brown, it sported one of two different head sculpts and two different torsos. Because of a change in production, many of The Empire Strikes Back figures featured heads that could easily be removable, therefore making it impossible to confirm that one head sculpt belonged exclusively with one torso. The two heads are quite similar, and without visual guide and a keen eye to detail is often overlooked by most collectors. The Torso, on the other hand, is quite easy to spot in clear photography and in person. Look no further than the little black rank bar on the figure?s left breast. The first version is completely smooth and lacks any detail while the second version clearly has four raised dots going across horizontally. Of all the variations on this figure none have proven itself scarcer than the others.